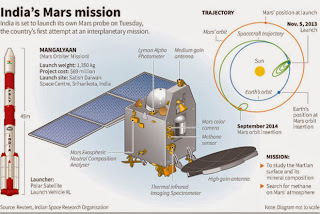 India on Tuesday afternoon entered into Mars odyssey with its polar rocket carrying Mars orbiter mission lifting off successfully from satish Dhawan space center. ISRO chairman K.. Radhakrishanan said that" The Indian rocket carrying 1st Mars orbiter was successfully launched on Tuesday afternoon. Radhahrishnana and also said that " I am extremely happy to say that PSLV-C25 places Mars orbiter space craft very exactly in the elliptical orbit around the earth. 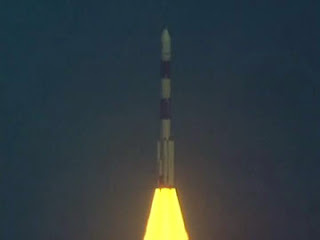 This is the 25th flight in PSLV series . Now it will be a complex mission to take Mars orbiter from earth's orbit to Mars orbit. The Take-off of the launch vehicle PSLV C-25 started at 2.38 PM from the spaceport , which was witnessed among others by minster of state in PMO, V. Narayanaswamy, U.S ambassador to Indian Nancy Powell, ISRO chairman Radhakrishnan and some other officials. After travelling around Earth ( perigee of 250 km and apogee of 23,500 km) in an elliptical orbit ,the orbiter would begin a 9 months long travel to reach to Mars around 12.42 am in December 1. The mission is expected to reach the Mars planet orbit by September 24, 2014 and moves around the elliptical orbit. The ISRO also most spent RS 450 crore on this mission . The Mission to Mars of the ISRO is aimed at establishing the country's capability to reach the Mars planet and focus on looking for the presence of methane , an indicator of life in mars and to know weather conditions present over their. The mars mission consists of five scientific instruments - Methane sensor for Mars ( MSM ), Lyman Alpha Photometer (LAP ) , Mars color camera ( MCC ) , Mars exospheric neutral composition Analyzer ( MENCA ) , and Thermal infrared imaging spectrometer ( TIS ).